We left our "Holoschool" feeling reborn. We did not know what our adventure would bring us, but we knew that we would be changed forever. Again, we walked back to our quarters to ground that which the Arcturian had shared with us while we stood in Its aura. Yes, the Arcturian did take us on another "ride" of swirling energies of light. Within this formless state of being we were able to understand all the information that we had downloaded from the Arcturian's aura. We stored all these important instructions regarding our Mission in our Multidimensional Minds. In this manner the information would be stored according to the state of consciousness that could read it. These instructions would come into our conscious awareness when the frequency of our consciousness was calibrated to the frequency of each message. Hence, while on the Mothership, we could remember and understand everything because we had the support of the Mothership's multidimensional consciousness and cosmic mind. Fortunately, included in our instructions was how to link with the Mothership so that we could amplify our own consciousness and use the Mothership's energy field to assist us with our teleportation. One of the first lessons the Mothership shared was for us to remember to store any physical form we are wearing in a safe place before teleporting. In our Higher Expressions of SELF, Mytria and I had ascended beyond the cycle of life and death. However, if we created an earth vessel and allowed it to be damaged, it would be a great distraction from our Mission. We also remembered that the Arcturian had told us that we would travel on the Athena to move closer to Earth. Hence, the Athena would be our headquarters for this Mission. Since the Athena's life force was always in contact with the Mothership, we could more easily interact with the Mothership. It gave us great comfort to know that we would be living on the Athena, as well remaining in touch with our Home on the Mothership. In fact, we would have this connection even if we were wearing the illusion of a physical, earth body. Since the third-dimensional frequency of reality is already a holographic realty being reflected from its core Matrix, it would be quite simple for us to create a human form from the Earth’s matrix. We thought about how we had once believed that our physical form was our SELF, and we totally believed that our physical bodies were real. We had no idea that our bodies were projections from a Matrix. This thought was quite disconcerting when we realized how deeply we mourned the loss of our friends and family who had disconnected from the Matrix to return to their higher frequency of SELF. We also remembered the great physical pain we experienced from our many war wounds and the deep emotional pain and mental angst that we suffered while under the illusion that the physical reality was the only real world. The power of forgetfulness and the need to attach to illusion is almost beyond understanding when perceived from our present state of consciousness. The Arcturian had said that many had become lost in their physicality. What if we got lost in the illusions of the third dimension too? Mytria instantly responded to my fearful thought with a sharp warning that that kind of thinking is exactly how we could become lost. We stopped, right in the center of a busy corridor and promised each other that we would assist each other to monitor our thoughts and emotions. We also reminded each other that we would have to eat and sleep on a regular routine whenever we wore our earth vessels. In fact, we decided that if at all possible we would return to the Athena every evening. Yes, that would be the solution. We would leave the time and polarity of the planet and return to the fifth-dimensional Starship. Then, we could debrief every day and have more contact with the Arcturian. Upon making that decision, we felt the Arcturian's immense energy field surround us with unconditional love and support. The Arcturian was reminding us that It could attend and respond to infinite thoughts, emotions and calls within the NOW. As we walked past the Mess Hall, we knew we needed to go in and say goodbye, for now, to our wonderful friends. Again, we stayed late into the night, telling ourselves with a smirk that we were "preparing for being physical." We laughed about that concept then, not knowing what an extreme challenge it would be for us to take on a physical form. I had been with the Arcturian, and Mytria had been with the Elohim Alycone. Then, we both shared wonderful experiences on the Mothership. Hence, we had no idea what was ahead for us. In fact, we scoffed at some of the dangers that our friends told us about. It appears that the main problem of lowering our frequency to the level of wearing a physical shell is that we can forget who we were and why we were there. The Arcturian tried to warn us of these dangers, but we did not want to hear them. Fortunately, I had studied about the control of my mind and the expansion of my consciousness, and Mytria had spent equal efforts learning to be master over her emotions and to connect with the Elohim of the planet. I have shared much of my learning from the Arcturian on the Mothership, Mytria was simultaneously learning about the power of emotion from the Arcturian and the Elohim of Alycone. Arcturians are actually Elohim, as Elohim are builders and holders of form. The Arcturians participated in the initial model of the Adam Kadmon, the original human form of Lightbody. 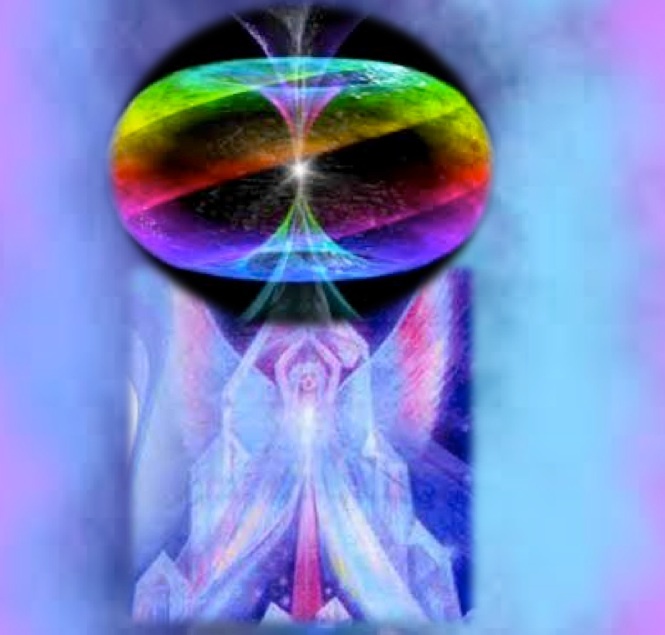 Since the Arcturians specialize in ascension, they teach the process of lowering the Lightbody into the physical form and, simultaneously, transmuting the physical form into Lightbody. In this manner, the Lightbody is the bonding force that connects the vast energy field of our Multidimensional SELF with our lowest frequency of SELF. Mytria will now share her initiations and service as a Keeper of the Violet Flame of Alycone. Dear Earth ascending ones, I greet you with my unconditional love. I am honored to share all that I have learned, what Mytre has learned, and what we have learned, and remembered together. I say remembered because we have infinitely existed within the great Flow of the ONE. However, once we lowered our consciousness into our third/fourth dimensional Pleiadian forms, we began to forget all that we had always known. It is for this reason that we have been so well prepared before our excursion into a physical reality. There is, of course, no accident that Mytre specialized on the male polarity of thinking and pure consciousness, whereas I specialized on the female polarity of emotions and nurturance of all forms of life. Now that we have merged into two Divine Complements into ONE, we can both easily access each other’s "specialty" within the ONE of our SELF. We hope that our stories will assist you to remember your true SELF, just as we have remembered ours. The lower worlds of the third and fourth dimensions are a holographic projection from the Inner Matrix of each world. However, the Inner Matrix is a mental projection from Beings in the higher worlds, such as the Arcturian Elohim. The great Cosmic Mind created the Matrix, which beckons traveling energy fields to log onto to their Matrix of reality. The unconditional love of your High Heart is what adheres the molecular construct of life to the higher frequencies Matrix. This situation is similar to the birthing reality that Mytre and I experienced. What we first experienced as a fog was actually the Matrix. The Matrix was invisible because there was no life attached it. The Matrix is a field of energy. The invisible Matrix is multidimensional, which means it resonates to many different frequencies of possible reality. The Matrix itself is more of a mental construct, and the different frequencies resonate to different emotional states of consciousness. For example, fear is a low frequency emotional state of consciousness and unconditional love is the highest frequency of emotional consciousness. The physical worlds have myriad Matrixes of which you are unaware. However, once the appropriate frequency and intention of emotionally charged thought-form finds it way into that energy pattern, it instantly adheres to the Matrix to create a birthing form and a portal into a dimensional expression of reality. When we live in the energy pattern of unconditional love, we are very "magnetic" and attract myriad possible realities to be born via the invisible matrix that always flows throughout form-based realities. If we are happy with the pattern we are living, it is important to live in Thanksgiving for that substance of that reality. Thanksgiving for the substance at hand will duplicate that substance indefinitely. Furthermore, the unseen Matrix is forever calling to enliven new possibilities of existence. Hence, thought, formless energy, is waiting to become manifest by the adherence of emotion that is forever searching new ways in which love can become manifest. However, emotion will only adhere to the frequency of Matrix that is of the same frequency. Therefore, fearful emotions (fear, anger, sorrow) also have a creative ability, as they will attach to a lower frequency of the reality Matrix. Fortunately, if unconditional love where to adhere to a low frequency Matrix, it would simply erase that energy pattern because the higher frequency can transmute a lower frequency with the power of its light. It is for this reason that unconditional love is such a valuable tool while wearing a third, or even fourth, dimensional form. If you match your emotion to the frequency of the Matrix, such as a fear with the lower frequency portion of the Matrix, you will experience a fearful reality. This choice is how you can become trapped in the Third Dimension. If you forget the power of unconditional love you can become increasingly afraid, which will attach you to lower and lower frequency Matrixes. This entrapment is how a spider captures its food. The insect becomes adhered to the spider’s sticky web. Then it struggles, which ensnares it even more in the web. Then the spider comes and actually wraps its prey up within the matrix of its web. In the same manner, if a fearful Matrix traps you because you have fallen into fear, your only exit it by BEING the frequency of unconditional love. The unconditional love will disarticulate the low frequency expressions of the Matrix, and you will be free to leave that reality and relocate to a reality based on unconditional love. My story left off when I entered the vortex into the Mother's Womb, which was our name for the planetary core where we first met the Arcturian and the Elohim of Alycone. Mytre had valiantly bi-located to be with me while I was preparing my consciousness to open the Portal of the Sacred Rock. It was surrendering into the unconditional love that Mytre and I share that enabled me to open this Portal and enter it while wearing my physical form. In the many years that Mytre and I were separated, I focused on the process of surrendering to love. Since I was suffering great sorrow at the loss of Mytre, as well as quite a bit of anger that we could not share raising our daughter, I had no choice but to meditate upon the discipline of choosing love. At first my love was conditional in that I would feel loving if I got what I wanted. In fact, I prayed to the Great Mother for years that I would serve Her if she would bring back my love. In other words, my love was conditional. It was conditional because it was laced with sadness and anger, which kept my consciousness below the frequency of unconditional love. Unconditional love is the highest frequency of light and the creative force of the Universe. In order for me to complete my Path of being a Keeper of the Violet Flame, I would have to live in unconditional love. I found the frequency of unconditional love within me while I was in Nature, when I was able to release Mytre to this duty, and while I was raising my daughter. However, my focus on the feeling of daily life without him and the loss of our family unit kept lowering my consciousness. It was my wonderful daughter, Alycia, who answered my prayers. Alycia was born with more wisdom, power and love than most adults, including myself. Caring for her was my honor, and her innate wisdom was my eternal teacher. As I parented Alycia, I realized that my love for her was far more important than the fear based emotions that were hidden in my heart. Also, we were still a family. For many we met with Mytre in our night body, which was wonderful training for our daughter, but unsatisfying for me. Fortunately, Alcyone, who was named after the Elohim with whom we both studied, came to my rescue. Yes, I took care of her as her body was one of a child, but she also took care of me. Her constant purity and innocence was a constant source of comfort and enlightenment for me. It was her innate unconditional love that kept me from becoming totally ensnared in the web of my fearful emotions. However, allow me to move forward in my story to the moment when I left my daughter and our Temple life. In fact, it was Alycia, who initiated my leaving. She came to me one sunny morning and said, "Mother, it is time for you to leave now." I was shocked that a teenager would come to me in such love and purity and tell me it was time to leave. In fact, my ego took over for a moment and, I started to become hurt and angry. Then, I noticed that Alycia had the Glow around her again and knew that she was speaking from her Elohim SELF. Within that one moment of realization, I knew that everything that had happened was according to a Divine Plane. There were no mistakes or accidents. With that realization, as well as the frequency of light emanating from my daughter, all my fearful emotions melted from my aura. I had long awaited this day, the day of my release from my painful emotions. I kneeled before Alycia, as she was somewhere within her Elohim presence, and sent her unconditional love and thanksgiving for the honor of being her mother. I realized then that everything that had happened was perfect and a component of our Divine Plane. I looked up into the pure, violet eyes of my daughter, the Elohim who I was honored to birth, and surrendered to Her blessing. I do not know how long this moment lasted, but it changed both of our lives. I knew that Alycia no longer needed me, and I could go back to my beloved Nature. I knew that we would be in constant contact, as I would be working with my daughter’s true Mother, the Elohim Alycone. Finally, the moment was broken when the High Priestess of the Temple entered the room. She had felt the energy from the most distant part of the Temple and came to investigate. When the High Priestess entered our room, she too, fell to her knees before the Glow of Alycia. The three of us remained within the energy until my daughter’s energy gave way and her physical form collapsed. Both the High Priestess and I caught her and carried her to her nearby bed. We lit incense and chanted while her sleeping form recovered from the sudden infusion of higher light into her young body. When Alycia awoke, she remembered everything. She had spent her entire life living in a Temple and surrounded by men and women who deeply loved her. I realized that Mytre had to leave because Alycia was meant to spend her formative years in this environment. Also, Mytre and I were meant to be separate as we traveled our paths of initiation. I surrender to the possibility that Mytre and I may have only briefly met in order to give Alycia her body. Yes, I thought with joy and thanksgiving that that brief time would be enough. At last I was healed of my fear and anger and ready to begin my service to the Great Mother, the Elohim of Alycone. More about these other matrixes would be interesting. Love the links to your other writing. I don't contact allot of people and I like to keep an open mind to new things. Though allot of what you write, at least this one( the first from you I have read) seems " out there", but honestly.....you're explaining everything I can recall. I don't want to share too much, because I don't know who to trust with this. I'm doing "missions" almost every night,and I can recall the ship "Athena" I know I've been there. I remember even the halls, and seeing many other beings. The first beings ever to physically contact me are the Arcturian, and I have great love for them. ( when I can recall "seeing them" they were very tall, and their energy VERY THERE. Not threatening, but very large and encompassing. If one is not aware of self and keeps fear of unknown, the energy can be intimidating even, but I digress.) They are my family. I feel so excited, but kind of sick from all this, like excitement perhaps? I want to share so much more, but want to make sure it's with people who will understand. If anyone can recall their lives as well, please, let me know. I've been searching for so long since I've become more aware. Don’t let it throw you if you share your experiences & someone makes a snarky comment. There will be sooooo many who will thoroughly enjoy reading, who will have had similar experiences, & those who will find that your comment helps them remember their own experiences.